What is the 90/10 Principle? 10% of life is made up of what happens to you. 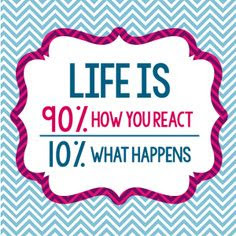 90% of life is decided by how you react. We really have no control over 10% of what happens to us. We cannot stop the car from breaking down. The plane will be late arriving, which throws our whole schedule off. You cannot control a red light, but you can control your reaction. Don’t let people fool you; YOU can control how you react. You are eating breakfast with your family. You have no control over what just what happened. You curse. You harshly scold your daughter for knocking the cup over. the cup too close to the edge of the table. finish breakfast and get ready for school. school.Your daughter runs into the building without saying goodbye. Your day has started terribly. wedge in your relationship with your spouse and daughter. Why? Because of how you reacted in the morning. in those 5 seconds is what caused your bad day. time to look through the window and see your child getting on the bus. staff. Your boss comments on how good the day you are having. Why? Because of how you REACTED. You really do not have any control over 10% of what happens. The other 90% is determined by your reaction. If someone says something negative about you, don’t be a sponge. Let the attack roll off like water on glass. You don’t have to let the negative comment affect you! React properly and it will not ruin your day. How do you react if someone cuts you off in traffic? Do you lose your temper? Pound on the steering wheel? A friend of mine had the steering wheel fall off! Do you curse? Does your blood pressure skyrocket? work? Why let the cars ruin your drive? Remember the 90/10 principle, and do not worry about it. take out your frustration on the flight attendant? She has no control over what is going on. stressed out? It will just make things worse. Now you know the 90-10 principle. Apply it and you will be amazed at the results. You will lose nothing if you try it. The 90-10 principle is incredible. Very few know and apply this principle. There never seem to be a success in life. Bad days follow bad days. life seems dreary and is not enjoyed to the fullest. Life is a bore and often seems cruel. Understand and apply the 90/10 principle. It will change your life.